Roo Wood white is a simple-to-use, high strength wood glue formulated especially for bonding wood, wood composite and other similar materials. 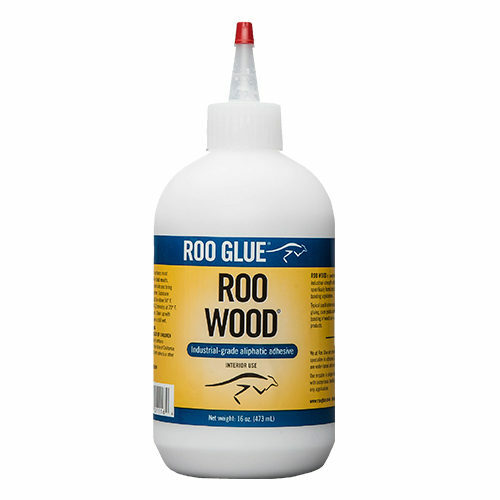 Roo Wood has a fast setting speed and good assembly time tolerance, and is a great choice when you need a heat resistant glue. It is available in white or yellow. Roo Wood should be applied to clean, dry surfaces only. For best results, substrate surface temperatures should be between 50-80° F. All joints should be freshly machined and fit tightly. Apply enough glue to get minimal squeeze out when clamped or pressed. Recommended clamp time is 1 hour at 70° F. For best results, cure overnight before machining.